Fourth Row Center: Film Writings by Jason Bailey: On DVD: "The White Ribbon"
Michael Haneke's The White Ribbon arrived in American theaters riding a wave of critical acclaim and sporting no less an endorsement than the Palme d'Or from this year's Cannes Film Festival. When a film comes with those kind of kudos, you feel an obligation, walking into the theater, to give it the benefit of the doubt, which I did; it melted away, slowly but surely, over the course of the picture's two and a half hours. I've lost patience with Haneke. He is clearly interested only in being a provocateur, a prickly director of difficult films that offer nothing more than misanthropy and cheap shots. The film begins with the voice of an elderly narrator, who tells us, "I can't know if the story I want to tell you is entirely true." 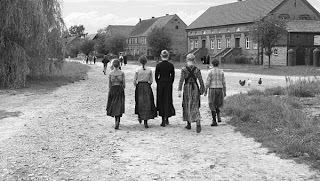 It is the story of the German village of Eichwald, pre-WWI. The village doctor is badly injured in a riding accident, apparently caused by a deliberate tripwire. The wealthy baron's son is kidnapped and beaten. A barn is burned. A canary is killed. A mentally challenged boy is attacked and perhaps blinded. Adults are horrible to children. Children are horrible to each other. That's pretty much the movie. As with much of Haneke's work, it is difficult to connect with the film emotionally; it is oddly formal and almost entirely airless. Save for a sweet, tentative romance between the town's school teacher (who is narrating the tale as an old man) and a nanny, there is little life to the film--it is constructed out of tightly-controlled compositions and seemingly disconnected vignettes. What exactly is he doing here? There is no doubt that he is a skilled filmmaker; the black and white cinematography (by Christian Berger) is luminous, and filled with breathtaking visuals (snow-covered landscapes, an elegantly burning barn). He knows how and when to disclose a horrifying revelation, and the second half of the film is permeated by an aura of dread. But to what end? His M.O. has grown predictable--he plays on base emotions and fears, using his considerable artistic gifts to create suspense (as in 2005's Cache), visceral terror (in Funny Games), or psychological discomfort (here). But, in film after film, he uses those real audience responses as a tease, as a set-up for a resolution he has no intention of delivering. He needs to learn (or remember) how to end a film. His last two pictures have been skillful exercises that denied us the payoffs (or, in Funny Games, that gave us that payoff and then cheated us out of it); they're like jokes without punch lines. Since the Greeks, the formula for tragedy demands that pity and fear be followed by catharsis--i.e., you make us sit through two and a half hours of bleak, black and white psychological pain, we'd better arrive somewhere at the end of it. You can't bludgeon your viewers and then give them no release valve. This is a basic human emotional requirement of our dramatics, and Haneke seems bound and determined to deny us of it, so in The White Ribbon, we get another of his puzzling, unsatisfying, elliptical endings, and then the movie is over. Puzzled, we wander out into the lobby of the theater and presume that there must be something wrong with us, since everyone else is acting like it's a masterpiece. It's not; it's the kind of tired, empty nihilism that your college roommate bored you with years ago. Questions must be asked of Haneke. He doesn't just get off the hook because he considers himself an intellectual and thinks he's examining "the depths of our existence." What is he trying to put across here? What message is he trying to convey? (That people are bad? Thanks for the insight.) How does he want us to feel about this material? Going to the press notes (never a good sign, when you have to go to the press notes), it seems that he believes he is making some sort of a penetrating statement about the nature of evil. Hew lord. The problem is, his cold, clinical style makes his films into laboratories; good, intellectual filmgoers respond to his movies because they're given the cues that they are high-minded and important, so their rhapsodic praise is borderline Pavlonian. They know, from the cleanness of the desaturated images and the choking restraint of the playing, that it is a Major Picture; good luck extricating a straight-faced explanation of what they're reacting to beyond that, because Heneke isn't doing anything beyond that. In The White Ribbon, is he examining evil, or just reveling in it? Is he exposing the horrors of child abuse, or exploiting them? We don't require the obviousness of a made-for-TV movie here; we just ask for some kind of passion, some sort of feeling, something resembling something. In his clinical detachment, his spiteful refusal to empathize, Heneke is as much a phony as the "mainstream" filmmakers he sneers at. Is the picture worth seeing? In many ways, yes--yes in that it is technically proficient and there are several powerful scenes. But it is also troubling; it stays with you, though in the wrong ways, and the further I get from it, the angrier I get at it. Haneke's progression as a filmmaker moving him away from the disturbingly raw yet undeniably sympathetic The Piano Teacher to The White Ribbon, which, with its impassive and unblinking eye, dehumanizes its subjects in manner that borders on offensive. It is a film of darkness and despair, told by a man in a lab coat--and though I may be alone on it, this viewer is tired of being his guinea pig. 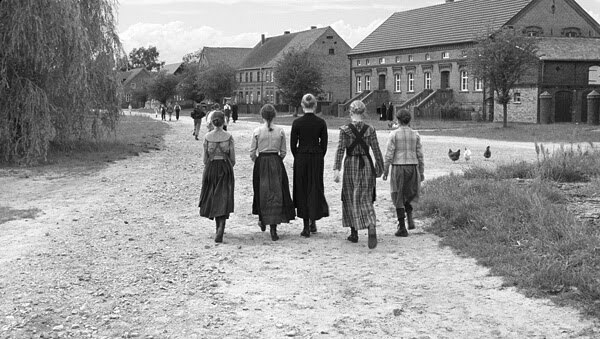 "The White Ribbon" arrives on DVD and Blu-ray on Tuesday, June 29th.